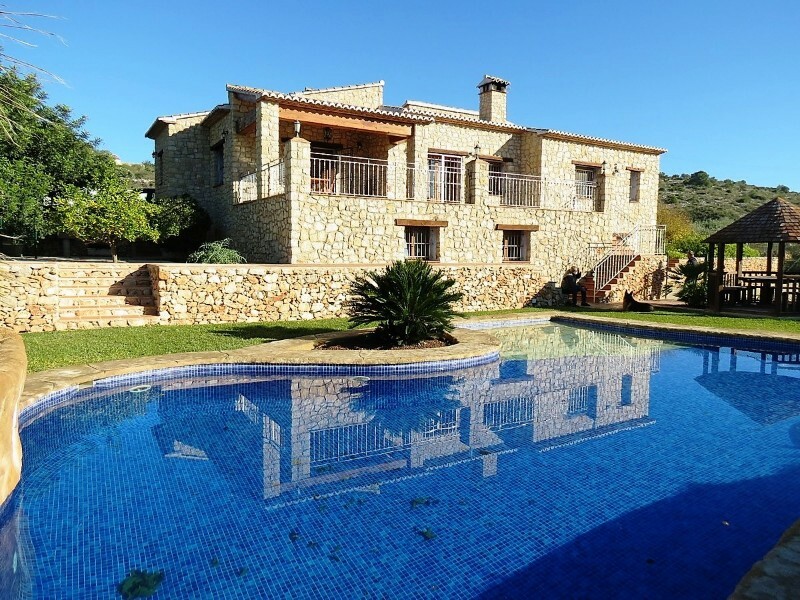 Beautiful finca for sale in Teulada. Located in a quiet area, a few minutes drive from Teulada is this traditional-style estate built in the year 2000 with beautiful woodwork for windows, doors and beams internal, giving the property a Spanish charm. The farm is located on a large plot of 11,000 m 2 including trees, gardens, terraces and a long road to a parking. The House has a large reception area, to the left there is an inner Hall with doors to a garage, a guest bedroom and bathroom and pantry. To the right of the Hall is an independent kitchen equipped with dishwasher, ceramic hob and fridge American style. A separate dining area with door overlooking the garden and a large terrace with barbecue. Also on this level there is an office, a master bedroom with fitted wardrobes, fireplace with caset. From the main hall a large arch opens onto a large living/dining room with fireplace with caset, 2 windows and two doors opening out onto a large covered terrace and swimming pool. A grand staircase leads to the first floor and a second living room, one kitchen and another small Hall. There is a large bedroom with private bathroom and private terrace door. Also on this level, there is another bedroom and private bathroom. Extras: central heating, double wooden windows, Gas fireplace with caset, alarm, spacious entrance, storeroom, shower by the pool and barbecue.